This article features a low parts count ACDC 5 Watts Charger Design with an output voltage of 5V and a maximum charge current of 1A. This is applicable for cell phones, tablets and other devices and gadgets that use 5 volt supply. This is a constant voltage constant current charger. A constant voltage means a steady level of the output voltage once full charge state has been reached. A constant current means a maximum charge current is controlled despite the battery is very drain and want to draw a high current in the few minutes’ right after it is connected to the charger. In this case, both the battery and the charger itself are protected from over current damage. This design uses an offline Flyback converter with primary side regulation. With primary side regulation, there is no need for Optocoupler and associated circuits thus lesser parts count. Download the schematic in PDF here. – R1 controls the in-rush current so that the bridge will not damage once C1 is fully empty than the charger is plug to AC outlet. – C1 serves as the DC link capacitor. The larger the better to achieve a good DC level. But a larger capacitance results to a physically bigger capacitor. – D4, C3, R13 and R15 are parts of the RCD clamp network. They will clamp the voltage so that the MOSFET Q1 will not damage. In actual testing, if the drain voltage of Q1 is not exceeding the rating, the RCD clamp parts are can be removed to save space. – R6, R7 and R8 are boot strap resistors needed to power the controller. Once the controller start giving pulse, the transformer auxiliary winding on pin 4 will be the one to supply the controller. – C4 is the output bulk capacitor. Increase the capacitance if the target ripple is not meet. 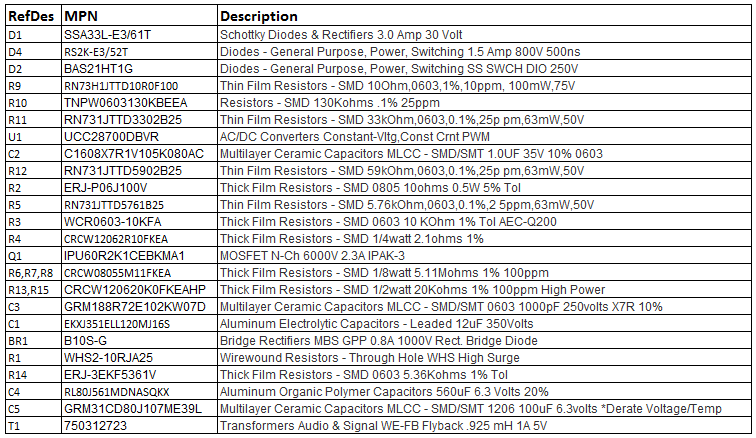 Below parts list is based on the smallest form factor possible. In case you have much space, you can increase the value of C1 and C4. Download the parts list in excel here. 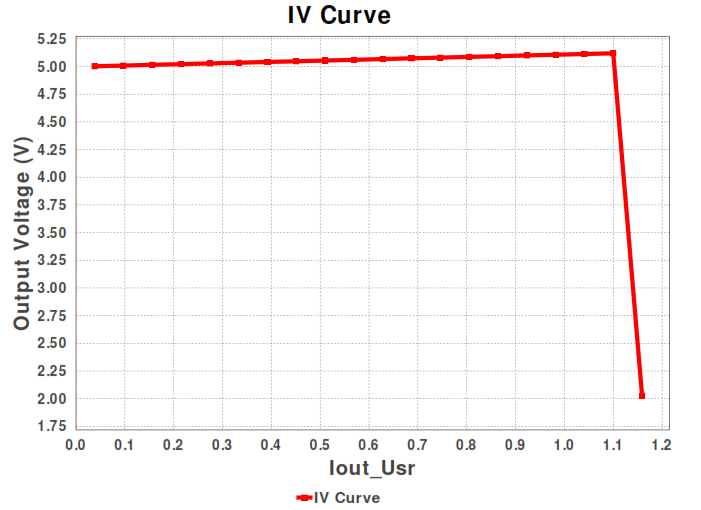 Below simulation result indicates how good the constant current and constant voltage features of this AC-DC 5 Watts Charger. At any load below 1A and until 1A, the charger output is within regulation of 5V (constant voltage). When the load is increased slightly above 1A, the voltage output starts to decrease and the current is being maintained (constant current) until the output turn off (protection level triggered) when the load is further increasing. If you tried this, please provide feedback whether working or not. If it works directly without any tuning, its very good and we can share this to everybody. If there are issues, please feedback so that we can solve until this will become a full working design.